While looking through www.handweaving.net for attractive 4-shaft straight draw structures for a warp of block (head) kitchen towels, (to satisfy both Mom's orders and my sample requirements for Ali,) I happened upon two interesting results. Go to the draft search page. In the top "Search by Original Text" space, set maximum and minimum shafts to "4", leave the treadle numbers at "any", and search a book called "Textile Designs and Colour, (William Watson)" towards the bottom of the list of books. Go though the four pages to see the visual complexity achievable on four shafts! Then change the minimum and maxim shafts to "16" (or any big number), leave the treadle numbers at "any", and search the book again. Of course the more shafts you have, the more structural complexity you can achieve, but are they necessarily visually more interesting than the 4-shaft drafts? I thought not. It gives me goose pimples thinking about the experiments I could do on Jack! I'm daydreaming of full of lovely fluffy stuff from my 4-shaft Jack filling in my girly cosy Etsy store! And not before too long, I hope!!! I'll show you the curtains, the wall papers and shelving I choose as I start decorating it! The above image above is Draft Number 61736. 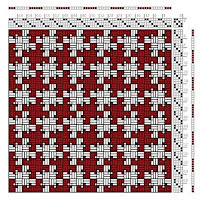 As for the block (head) weave, I've been trying to get my head around it a while now, and I sense there is a corner approaching, but I still can't see it. EDIT: In one short swift email, on New Year's Day, Ali blitzed my understanding of blocks and dumped me with a whole new idea. It was entirely different from the answer I was expecting to my question, so the towel project is suffering a setback. Hummm... Maybe I'll weave this lot the way I had planned. Peg Moorhouse's Exhibition: "Color and Light"
How Long is the Life of Textile?